After you make your dog feel his dapper best with a thorough pamper with our pet groomer, browse our pet supplies! St. John's pet owners know that Dogs Divine has everything they need in order to take care of their furry best friends in the finest style. Whether you want to dress your pet to the nines in a new bandana for the next holiday gathering, keep her Dogs Divine 'do fresh with quality grooming aids, or help her stay active and healthy with her favourite toys; we have the pet supplies you need. And for goodness' sake, don't forget the treats! 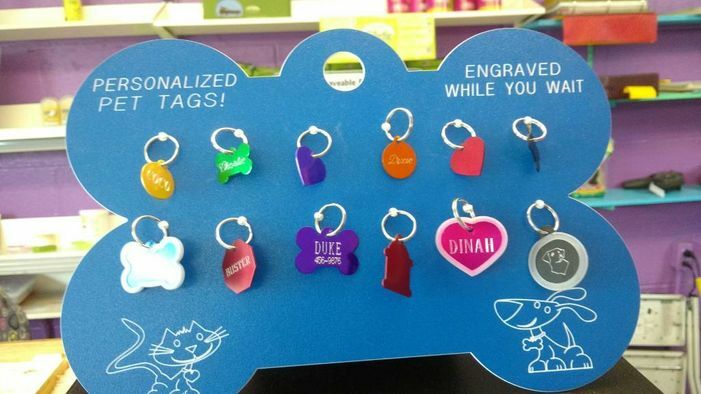 Dogs Divine is now proud to offer personalized dog tags in minutes. Our tags come in a variety of styles and colors and are engraved while you wait, so you can put them to use right away. We have the ability to engrave your pet’s name as well as any contact info you may want on the tag. Call or stop by today to see what we can make for your dog. We’re also an official retailer of Precise Pet Products’ holistic dog and cat food products. When’s the last time you brought in your four-legged friend?